In his short career as a power within the Republican Party, Steve Bannon committed a litany of crimes and mistakes. He brought white supremacists and Nazis into mainstream party politics; he whipped up discontent against loyal Trump allies in Congress on behalf of insurgents who couldn’t win (and who also happened to be theocratic child-molesters). But Bannon has finally done something truly unforgivable: He told the truth about Donald Trump. 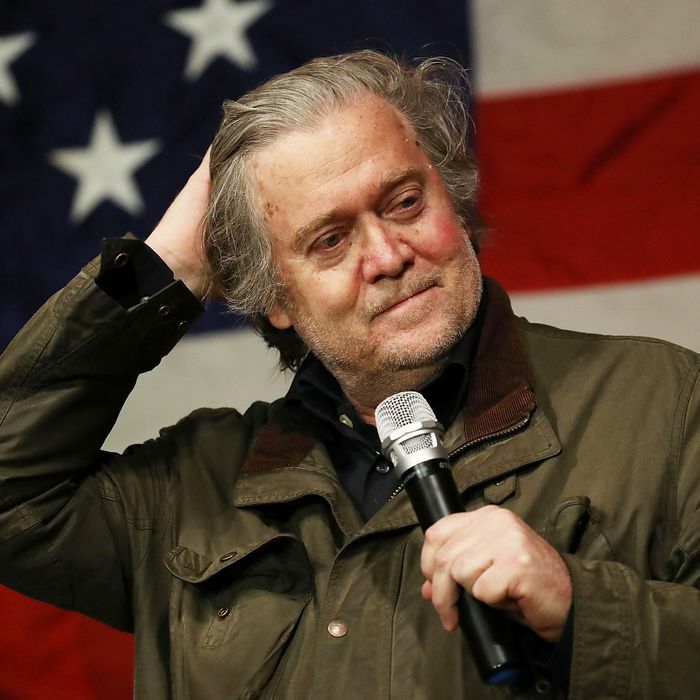 Bannon’s cooperation with Michael Wolff’s dishy account, which paints the president as a man-child and his son as treasonous, has prompted his swift excommunication. Bannon’s funders have pulled the plug on his rogue pseudo-populist operation and even his lavish security detail. Trump has given him a derisive nickname. Mitch McConnell, Bannon’s bête noire, is openly celebrating the demise of his adversary. Trump had long since abandoned his “nationalist” agenda and given himself over to standard Republican policy. Bannon’s content-free insurgency on Trump’s behalf was the last vestige of conflict between the party and the president. Having removed the most pronounced irritant in their relationship, the president and the party apparatus have drawn more tightly together than ever before. And so the publication of a book detailing that nearly everybody who works for Trump considers him utterly unfit for office has had the perverse outcome of solidifying party support for that very president. The conflict over Wolff’s book crystalizes a paradox about the current moment: Trump’s reputation among Washington political professionals has never been lower, and yet his institutional support among Republicans has never been higher. Wolff chronicles, in exaggerated fashion, a reality that is broadly understood within the administration. As Jim VandeHei (a reporter who frequently attacks the media for alleged liberal bias) concedes, the impression of Trump as a man-child, driven by emotional impulses and unable to absorb detailed written information, is universal within the administration. Trump’s furious legal threat against Wolff is itself further confirmation: Everybody except Trump understands his lawsuit stands no chance of success, and is certain to increase book sales, yet none of them think reason stands any chance of calming his temper tantrum. Trump’s authoritarian compulsion is one outcome of his ignorance and lack of emotional self-control. The president cannot absorb basic facts about the rule of law that constrain his impulse to dominate others. He has both privately and openly stated his belief that the Department of Justice should protect the president and his family’s personal interests even if they are guilty, as if the FBI were Trump Organization rent-a-cops. Republicans in Congress have increasingly adapted themselves to Trump’s position. Multiple new signs of this movement have appeared in the last day. Two prominent right-wing members of Congress wrote an op-ed calling for the firing of Jeff Sessions, which would allow Trump to appoint a new attorney general who would not be recused from the Russia investigation (and who could, thus, fire Robert Mueller or smother his probe). The Department of Justice may be giving in to Trump’s demands that it launch attacks on his vanquished campaign foe. Betsy Woodruff reports that the Department is looking again at Clinton’s emails. John Solomon reports the FBI is investigating the Clinton Foundation. In the House of Representatives, what was supposed to be an investigation of Russian interference into the election has turned into a counter-investigation of Robert Mueller on Trump’s behalf. The entire Republican message machine has coalesced around absurd conspiracy theories that the (largely Republican) FBI is overrun with liberal bias. Rod Rosenstein, the (Republican-appointed) deputy attorney general, met yesterday with Paul Ryan to plead with the House Speaker to limit the chamber’s wild attacks on his agency. Ryan rebuffed Rosenstein. The party’s leadership has come to endorse the most paranoid beliefs of the party’s conspiratorial fringe. “I think there was a lot of division a few months ago, but the more the GOP members find out … the more there is an aligning of investigative strategies and tactics,” one Republican member of Congress tells Politico. A year ago, Republicans met the incoming Trump administration with a combination of giddy anticipation and deep misgivings. The anticipated gains have been largely, if not completely met. But the worst of their fears have also been confirmed. The president is unbalanced, apparently in a state of mental decline, congenitally undemocratic, and quite obviously guilty of a wide array of misdeeds. The party’s response to these facts is to commit itself fully to obstruction and perversion of justice. Christopher Ruddy, the conservative publisher and Trump buddy, casually boasts that the defenestration of Bannon proves, “The base is owned and operated by Donald Trump.” Likewise, the congressional party is owned and operated by its base. Bannon’s exit has paved the way for the full subordination of the Legislative branch by its mad king.